With fall right around the corner and new arrivals hitting stores, I’m seeing a lot of great green shades. The color is so rich (no pun intended) and gets along famously with other fall hues like plum and black. Some of my favorite pieces include this printed Marni sheath and these Jenni Kayne flats. What color are you planning to sport all of fall? Click through the numbers below to shop your faves! I love emerald so I am loving #1, 5 and 10. Great picks! Emerald & forest greens are my absolute favorite so far! They are so perfect for the season! I love your round up here, the coat & sweater are particularly cute & cozy. This has always been one of my favorite hues for fall/winter – looking forward to adding more of it to my closet this year…love your picks!! I’m so excited for jewel tones! One of my favorite color palettes. I started wearing green recently, and I’m definitely going to try this deeper shade. Great picks! I’m wearing green in my post today! How funny. I’m craving this forest green color as well though. Love fall shades. such a gorgeous color. you would probably love the j.crew merino boyfriend sweater (they have a similar color).. just a thought :) love the picks as always!!! OH yes! LOVE all of these so much-that color is just perfection, right?! Okay, you and your style choices are killing me…I’m always thinking green…greenbacks, Emerald green for my birthday and lucky green clovers. Love green! Great roundup, Merritt! LOVE THE INSIGHT!! everything in this pallet is so cute! absolutely love your blog! 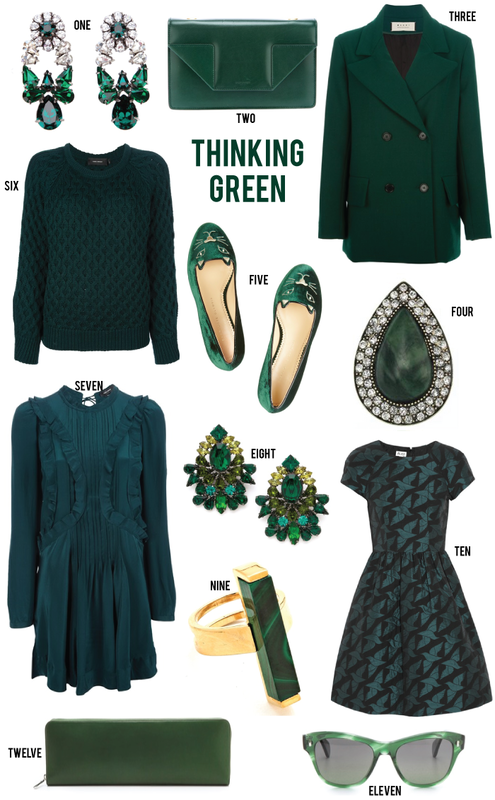 Cant wait til fall to try all emerald everything! If you have time come check out my blog. These are all amazing picks!! Loving emerald this season. Love your blog! I like that color that’s mostly navy, with a little bit of an emerald hint going on. Most people would probably just call it navy — but I guess I like my navy with a little bit of green!